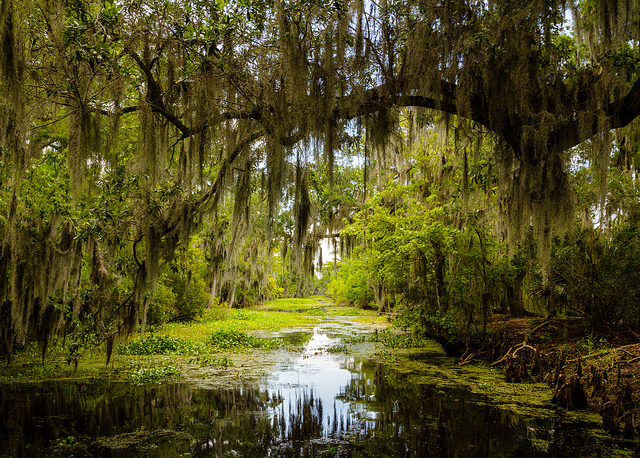 Swamp in Louisiana (outside New Orleans); photo by The Q Speaks on Flickr (noncommercial use permitted with attribution / share alike). Cajun fried shrimp and a cypress knee. I'm Bienville, Captain Shreve, Beauregard, Zack Taylor and Jean Lafitte. I'm New Orleans, the land of dreams Creole cookin' and a Mardi Gras king. Avery Island and a Catahoula hound. The Evangeline, Chickory Coffee and Baton Rouge. The Atchafalaya and an old plantation home. A sugar cane patch, Pete Fountain, French Quarter and Satchmo. Well, I'm the Mississippi River as it rounds the bend. I am Louisiana. Ya'll Come Back Again.